When we talk about Earn money with blogging or article writing content writing is a key of success, but in google algorithm unique content is must with proper seo which increase ranking in google and you will get more traffic if your blog or website was rank in the first of google. So today we covered How To Write Seo Optimize Blog post Which Increase Ranking In Google and earn money from blogger or website. Key word Researching is the base of seo, if you do not know about keyword research we suggest you to read this blog where we give detailed information about keyword research so make sure you read it before writing any article. After finding proper keywords about you niche or article the next step is to find non copy writing images. You can find non copy right images here Pixel , but most people cant find the right images for there article here, so simple screenshot image from google image search and add you tag in image and also add alt tags when you add image in your blog but make sure the picture does not contain any other site logo. Don't confuse H1 and H2 Tags Heading 1 and heading 2 which is mandatory to use article to rank you blog. the title of your blog must be a H1 tag means The heading of your blog only use h1 tag and there is only one H1 tag use in article. H2 tag can be use 2 or 3 times which is subheading of your article. 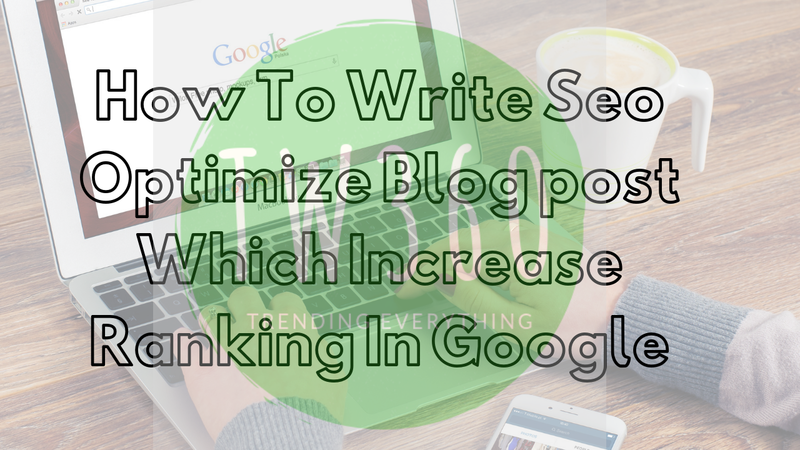 So i hope you know the basic of "How To Write Seo Optimize Blog post Which Increase Ranking In Google". if you have any query of suggestion you can comment down below.